A unifying trait of all cultures and languages is playfulness — a desire to have fun with language, to twist it this way and that, and to create out of grammatical rules and restrictions a game of words and sounds that renders communication a dynamic and living art. One way people have done this is through the creation of palindromes, which are words and sentences that read the same forwards and backwards. The word itself is derived from the Greek meaning to run back again (palín = again + drom–, drameîn = to run). Most language historians credit the formal development of the palindrome to Sotades The Obscene of Maronea, a 3rd century B.C. Greek poet who was killed by Ptolemy II for insulting the Egyptian king with a seemingly innocuous verse, which when read backwards revealed a salacious critique. Though his work did not survive, it is believed that Sotades composed a fully palindromic version of Homer’s Illiad. 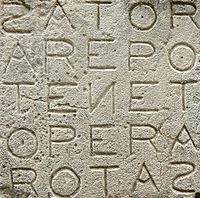 For centuries, palindromes were known as Sotadic Verses. Luckily, we can enjoy the pleasures of palindromes without fear of being killed by the King of Egypt, or anyone else. A hymn I plug, deified as a sign in ruby ash. The longest published French-language palindrome is Georges Perec’s Le Grand Palindrome, a 5,566-word piece published in 1969. If you have any amazing palindromes you’d like to share, feel free to leave a comment!